A 33-year-old Myanmar woman, who received officials’ warning for putting her seven-year-old daughter in chains in front of their apartment in Phuket’s Muang district, Thailand, claimed she did so out of love and caring because the “naughty” girl could be harmed or run over by a car. 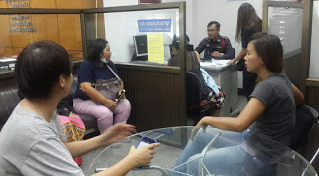 After an image of the chained girl was shared on Thai social media, and subsequent child abuse complaints, Phuket children and family home care head Atchara Surakul and other officials went to inspect the apartment at 10am on Tuesday. They told the family via a Myanmar language interpreter that they couldn’t chain a child, then took the mother, stepfather and children to Muang Phuket Police Station to record the incident. Officials took the girl and her nine-year-old brother into temporary care pending an inquiry into the family’s situation. Atchara said the mother claimed that the girl was naughty and the chain was used to keep her from harm while the mother took care of a one-month-old child born to her and her new Myanmar husband. The couple both worked in the construction worker industry. Officials said the seven-year-old girl also had bruises, and the mother had admitted hitting her for being naughty. The Myanmar woman, whose name was withheld pending investigation, has five children – four of them from her previous husband. Three of these – the “naughty” girl and her siblings aged 17 and 9 – came to stay with her in Thailand five months ago. Atchara said the authorities did not want to take the children away, but they had to move two of the children as a temporary measure. She said officials would talk to the mother about how to raise children. A multidiscipline team would also discuss concrete ways to help the family.